Early this summer, just days after entering orbit, the Cassini-Huygens spacecraft sent back its first findings from Saturn. Preliminary science results are beginning to shed new light on a complex and fascinating planetary system. Having discovered new satellites and made measurements of unprecedented precision, Cassini’s first weeks at Saturn are already looking very promising. During its first orbital revolutions around Saturn, Cassini’s observations of the planet’s satellites whetted the appetite of mission scientists in expectation of the more in-depth studies to come, which should tell us more about these celestial objects and their history. For example, one of the objects the scientists have in their sights is Titan. Early observations have yielded data about the opaque haze shrouding Saturn’s largest moon. But for the time being it remains largely cloaked in mystery. Scientists hope to learn more about Titan from the Cassini orbiter and the Huygens probe, which will be released into its atmosphere next January. During its 4-year mission, Cassini should also improve our understanding of the geologic history of Rhea and its cratered surface, determine the composition of the dark side of Iapetus, and unveil the secrets of Enceladus, the most reflective body in the Solar System. Cassini has already discovered 2 and possibly 3 new satellites since entering orbit. The latest discovery, provisionally named S/2004 S3, was made on 9 September at the edge of the F ring. According to NASA’s Jet Propulsion Laboratory (JPL), the discovery of a 3rd satellite could be confirmed shortly. Since July, the first close-up observations of Saturn’s rings have provided intriguing information about their composition. 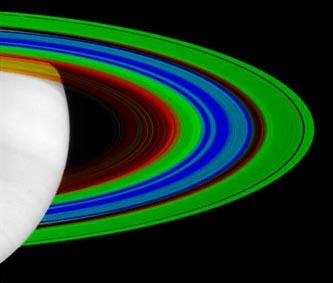 While the rings are chiefly composed of water ice, new findings show that the gap between the A and B rings, called the Cassini Division, contains more “dirt” than ice. The particles between the rings seem remarkably similar to the dark material seen on Saturn's moon, Phoebe. These dark particles refuel the theory that the rings might be the remnants of a moon. In just 2 days, scientific knowledge of the rings took a big step forward. Early in September, Cassini measured the temperature of the rings. Readings revealed the warmest areas are at about 110 K (–163°C) and the coolest 70 K (–203°C). 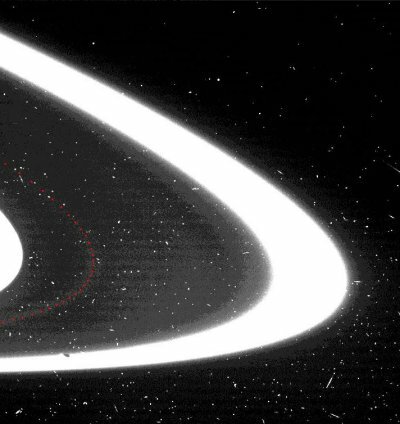 Data from the CIRS instrument (Composite InfraRed Spectrometer) show that opaque regions like the outer A ring and middle B ring are cooler than more transparent regions such as the Cassini Division and the inner C ring. Scientists had predicted this might be the case, because the opaque ring areas would let less light through, and the transparent areas, more. Cassini’s most recent discovery is a new ring 300 km wide with a radius of 138,000 km, associated with Saturn’s moon, Atlas. There is no way of knowing yet if the newfound ring extends all the way around the planet. Europe’s Huygens probe has also successfully completed one of the last planned tests before preparing to plunge into the atmosphere of Titan.